The J & D Ranch, located near George West, Texas is a high fenced game ranch with an abundance of native and exotic wild life. The ranch began as a cattle operation until it was purchased by Jeff Curtiss in 2003. 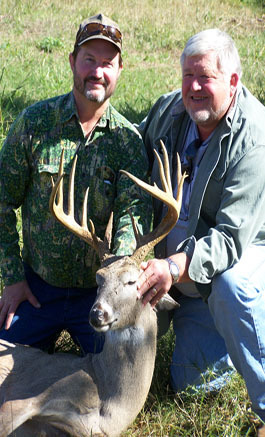 Mr. Curtiss had dreams of turning the property into one of the finest hunting ranches in South Texas. Improvements include a log cabin hunting lodge elevated 10' off the ground with a large deck allowing you to over look several †feeders located on the ranch. Acres of food plots have been planted to provide the wildlife with a variety of high-protein vegetation. † There are numerous 1,000-2,000 lb. protein feeders as well as corn feeders to keep the animals healthy.